People love cereal boxes; they love them for the yummy cereal, for the freebies inside, coupons and definitely for the catchy photos made on a cereal box. Those photos and graphics are sometimes so catchy that they grab the customers by eye-balls and lure them into buying the cereal right off the bat. This effect is made possible only and only because of custom cereal boxes; readymade cereal boxes can just preserve the cereal and ship it, at their best. Such is the nature of cereal business these days; preserving is only the starting line, the deal is much about branding and marketing. Why Get Custom Cereal Boxes? Custom made cereal boxes beat readymade cereal boxes at all levels. Get this; packaging is not all about storing or shipping products. This is what all sorts of packaging do. The biggest job of a packaging is to increase the shelf life of a product and protect it from natural stimuli such as UV rays and moisture. However, this is not all of it; even bigger is the task to use packaging as a means to branding and marketing. These two tasks: branding and preserving the cereals is not what readymade packaging can make possible. What is in a Personalized Cereal Box? Material – First impression is not made of the material, but material definitely makes or breaks the first impression. You can choose from various different types of materials such as corrugated fiberboard, Kraft, cardboard and Bux board etc. Colors – Readymade boxes come in the coloring pre-decided by the packaging company. 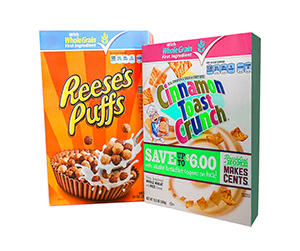 However, customized cereal boxes always offer two or more coloring options such as CMYK model or Pantone. Shape & Structure – The shape and or structure of the readymade boxes do not accommodate many customizations. However, in case of custom-made cereal boxes, you get many options such as auto-bottom, 123 bottom, straight tuck-end and reverse tuck-end etc. Design & Finish – The designing and finishing of custom-made cereal boxes is not comparable to that of readymade packaging. In case of custom designed cereal boxes, you can enjoy choices such as glossy or matte finish, spot or full UV, aqueous coating or die cut window pane, embossing or debossing etc. 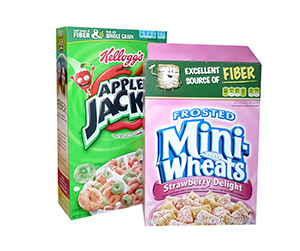 Why Get Customized Cereal Boxes from PackagingBlue.Com? Affordable Pricing – We provide very high quality packaging at unbelievably affordable rates. Our pricing is only highly competitive and customer friendly. Free Shipping – Whatever we charge is clearly negotiated with the customer and there are no hidden charges whatsoever. For example, other companies apply the shipping charges on top of packaging charges, but we ship totally free of cost. Professional Offset Printing – The quality of our offset printing is simply unmatched. Our quality assurance experts check every custom cereal box before ever it is shipped to the customers. Fast Turnaround Time – We do not take an entire week to ship your packaging to your doorstep; our turnaround time is the fastest and it is only 3 to 4 business days. Customer & Sales Support – We have two entire teams to make it possible that you get the best kind of support before the sale as well as after the sale is closed. Eco-friendly Packaging – The materials used at PackagingBlue.Com are based on wood pulp, and they are free of any hazardous chemicals or non-biodegradable elements. Our 100% eco-friendly packaging poses no harm to the environment, kids or animals.